Burrows deeply into sandy areas of the Bay’s bottom. Can tolerate large temperature fluctuations, polluted water and low oxygen levels. In winter, it may migrate to deeper waters to avoid freezing surface waters. 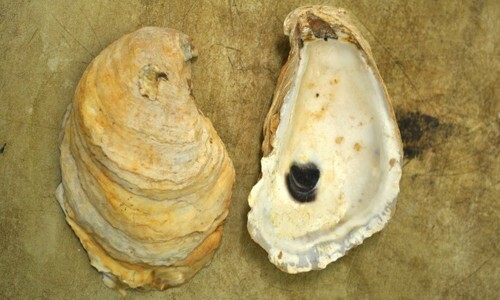 Found in the lower Chesapeake Bay along the western shore of Virginia from New Point Comfort to Cape Henry and into the James and York rivers. Native to the Sea of Japan and the Bohai, Yellow and East China seas in Asia. The veined rapa whelk grows to 6 to 7 inches in length. It has a heavy, rounded shell with a short spire and large body whorl. Its shell is almost as wide as it is long, giving it a boxy appearance, and it varies in color from gray to reddish-brown with dark brown dashes on the spiral ribs. 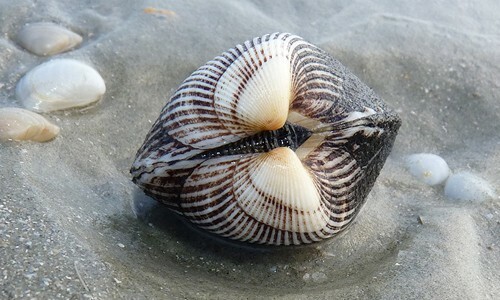 Most shells have distinctive black veins throughout. The inside of the shell is deep orange. Rapa whelks prey upon bivalves such as clams, oysters and mussels. They smother prey by wrapping themselves around the hinge of their prey’s shells, then feeding between the opened shells. Turtles and other seasonally migrating large predators may prey on young rapa whelks. Once rapa whelks reach their adult size, they likely do not have any predators in the Bay. During warmer months, rapa whelks lay groups of egg cases attached to rocks and other hard surfaces. Rapa whelk egg cases look like small mats of yellow shag carpet. Each egg case is approximately 2 inches tall and one-quarter of an inch thick. In approximately 18 to 26 days, tiny, free-swimming larvae hatch from a small hole at the top of each egg case. After 4 to 6 weeks, larvae settle to the bottom and eventually grow into hard-shelled adults. Young grow rapidly during their first year and can reproduce by their second year. Rapa whelks can live longer than 10 years. The veined rapa whelk is a gastropod, a type of mollusk that includes whelks, snails and slugs. It is also known as the Asian rapa whelk. It was discovered in the Chesapeake Bay in 1998 by a trawl survey group with the Virginia Institute of Marine Science (VIMS). Rapa whelks were likely introduced into the Bay through ships that released ballast water containing tiny rapa whelk larvae. It’s important to report rapa whelk sightings to VIMS so scientists can track their distribution in the Bay. If you think you have found a veined rapa whelk, call the VIMS Rapa Whelk Reporting Line at (804) 684-7361.